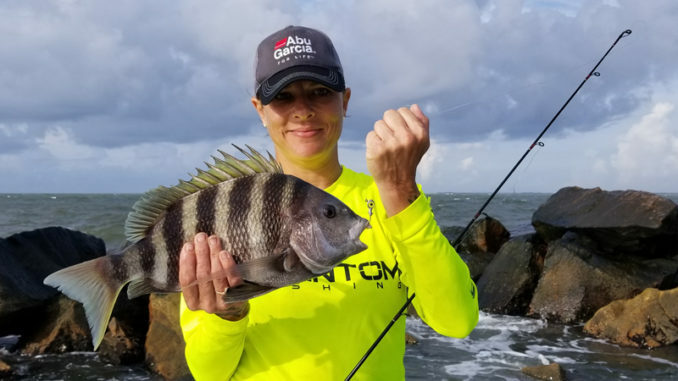 Christy Medlin caught this sheepshead on a Ralph Phillips jighead baited with a fiddler crab while fishing around a lowcountry jetty. The sheepshead bite is hot throughout the inlets and creeks of the inshore waters throughout both Carolinas. These sneaky bait-thieves are a lot of fun to catch, but the technique to hook them is unique. 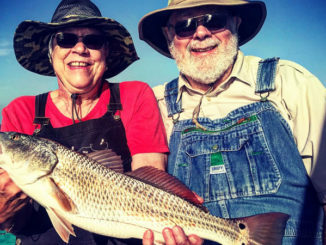 When fishing for redfish, speckled trout, and flounder, anglers are usually dragging a live bait or artificial lure slowly across the bottom, suspending it under a popping cork, or swimming it through the water column. But when sheepshead fishing, it’s all about fishing straight up and down. Marc Deschenes of V.I.P. Adventures in Summerville, S.C. uses two different rigs when fishing for sheepshead. “I use a Carolina rig with an egg sinker, a barrel swivel, a 12- to 18-inch fluorocarbon leader, and a 3/0 hook. And I sometimes use a 3/8-ounce Ralph Phillips jighead instead of that whole rig. For either one, I put a fiddler crab on the hook. Depending on the tide or current, one of those setups will often work a little better than the other. They’re both good rigs, but sometimes one is slightly better,” said Deschenes (843-708-5473). Rock jetties, concrete walls, sunken trees, and dock or pier pilings are all good places to fish for sheepshead. They’ll gather on any type of structure that holds barnacles. And anglers can use those barnacles to their advantage by turning them into chum. 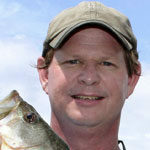 “Before I even start fishing, I scrape barnacles off bridge pilings, jetties, or anywhere I can find them. I put them in a 5-gallon bucket and crush them up into small pieces. I dump some out right where I’m about to fish. 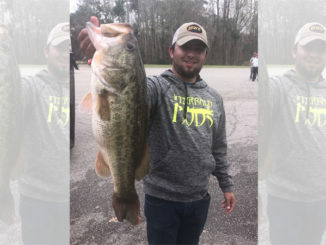 It really gets the fish in a feeding mood,” he said. And once the chum is in the water, Deschenes drops a fiddler crab down on one of his rigs. 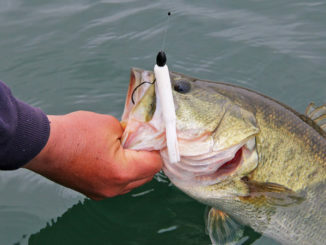 And while many anglers just hold the bait steady, he does things a little different. “I’m constantly lifting up my rod tip very slightly. These fish bite very subtly. I can detect a strike easier if I’m lightly lifting on the rod. If you don’t set the hook immediately on these fish, they’re gone,” he said. Deschenes said the incoming tide is usually better than the outgoing tide. “As the tide comes in, the water covers up more barnacles. So these fish have more food available as the water rises,” he said. Deschenes said the sheepshead bite should continue to be strong throughout the spring, summer, and fall. “It’s really hot in the spring, slows down slightly in the summer, then gets red hot again in the fall,” he said.